The image above was created by user Matticus78 to illustrate the Wikipedia entry on Phantograms. It attempts to convey the reconstruction of an anamorphic projection of a chess piece created from a stereoscopic pair of camera images that are printed in anaglyph. 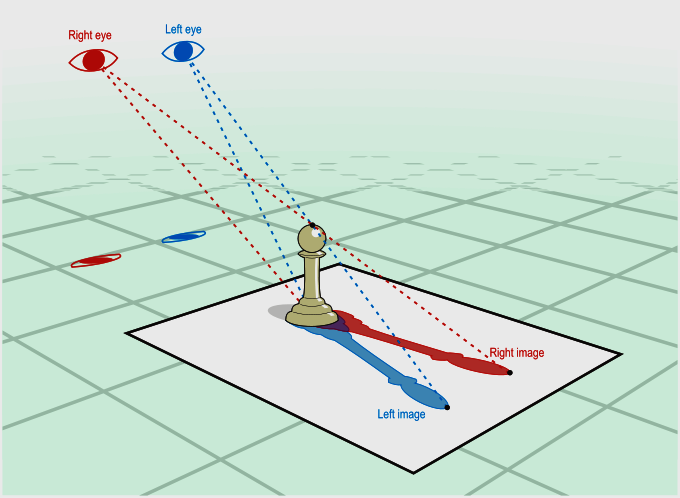 A spectator wearing anaglyph glasses and standing in the same position as the camera had been placed experiences perspectival anamorphosis in a way that creates the illusion of the pawn standing erect on the table surface. Eric Kurland was an invited guest artist for the 2012 Explorations in Stereoscopic Imagery course exhibition in the B&W Studio Gallery A404. The cross-eye version of Eric’s motion phantogram above is a screen grab from a YouTube video documenting the show. Earlier in the semester Eric had made a visiting artist presentation to the class, where –in addition to showing a wide range of work– he discussed his motion phantogram of a dancing tin toy robot. The phantogram is projected from below through a table top made of rear screen material. 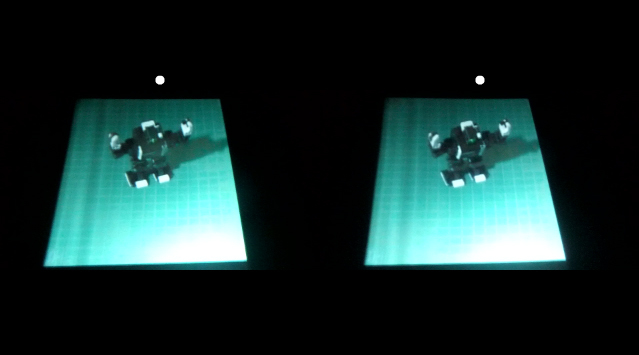 The viewer wears a pair of active polarization stereoscopic glasses that are electronically synced to the alternating left/right image pair of the stereoscopic projection. People viewing the work had a tendency to reach out and pass their hand though the hologram-like image of the robot. 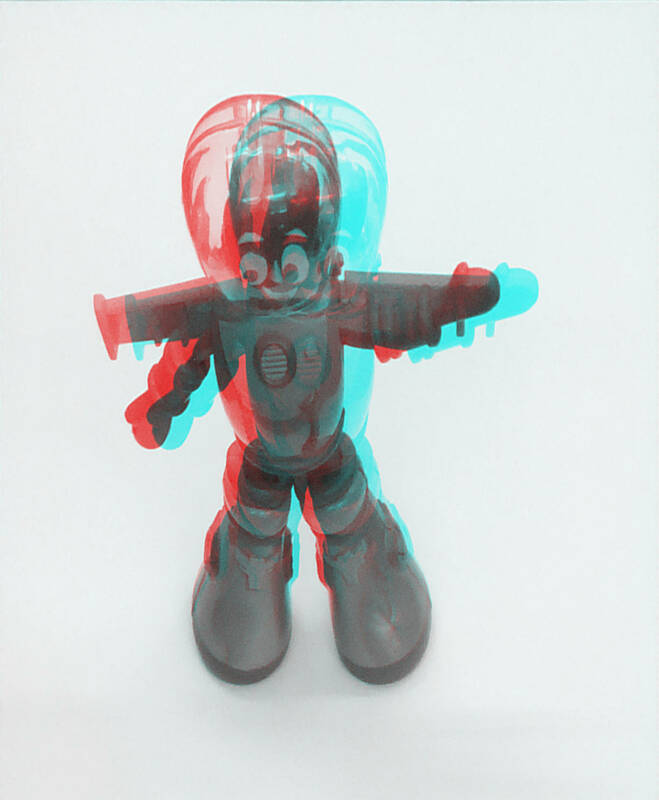 Masuji Suto has added an Easy Create Pop-up Anaglyph function to StereoPhoto Maker. The online help guide is fairly easy to understand. Following is a simple description of a basic workflow. You can import a stereo image shot in the MPO format as we have done in class with my Fuji W3 (or you can bring in individual left and right images –perhaps shot with the Mark Roberts S3 Stereoscopic Stepper or a manual slide bar). 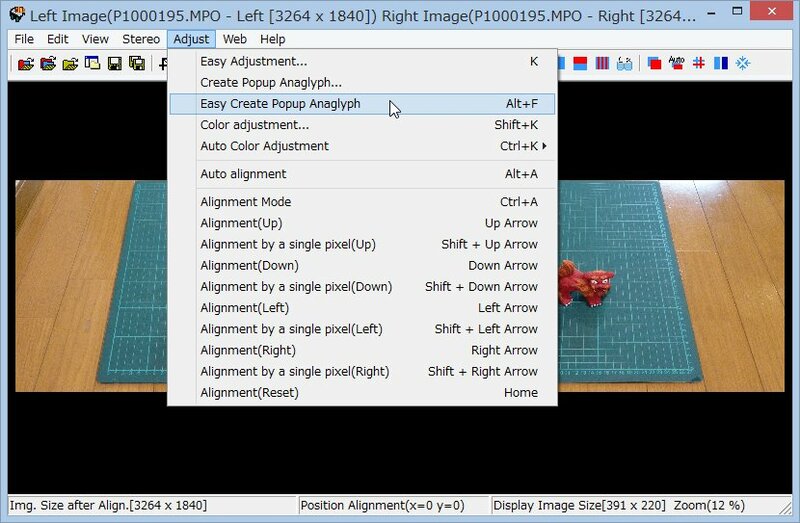 Once the two side-by-side images are in the Easy Create Pop-up Anaglyph workspace you click on the Pht shortcut button (located on the far right of the menu bar) to bring up point tool and align crosshairs to click and select a corner of the left image followed by selecting the analogous corner of the right image. You then use the point tool to select the next corner (consistently working in either a clockwise or counterclockwise direction) of each image. Repeat this until you have selected all four analogous corners. Once that is done you will select the Match L/R radio button for rectangle. If you shot on an 8.5″ x 11″ sheet of paper you will need to enter the following Aspect Ratio values: X = 216 mm, Y = 279 mm. Clicking OK creates the correct anamorphosis. You will most likely want to crop the anaglyph image to the margins of the original sheet of paper and then print a similar sized sheet (click and drag to set the crop margins). The online help is more detailed than this simple description and will allow you to experiment with a wide range of alternative techniques. Masuji Suto created this rapid fire overview of the new Phantogram functions in his StereoPhoto Maker program. Sample results based upon an in-class phantogram shoot. A print or electronic display of the anamorphic image is intended to be viewed laying horizontally on a tabletop by a spectator standing just in front of and above the image at approximately the same 45 degree angle used in shooting the original image. The sweet spot for viewing the image is essentially equal to the position of the camera with which it was acquired. While anaglyph images displayed on computer monitors and projectors work reasonably well, the creation of anaglyph phantogram prints using ordinary inkjet or laser color printers suffers from cross talk (ghosting) in the cyan channel primarily due to the lack of spectral purity in the cyan ink. Offset printing inks provide anaglyph images with less crosstalk. The problems of crosstalk in printing anaglyph images are quite complex. Andrew Woods, et al, published a seminal research paper on the topic, Characterizing and Reducing Crosstalk in Printed Anaglyph Stereoscopic 3D Images in Optical Engineering, Volume 52 , Issue 4.